For bachelor’s degree holders, nabbing a high-paying job often hinges on finding out which sectors of the economy most need educated workers. Identifying the right roles where employers are clamoring to hire them allows those with this undergraduate degree to snag a gig that offers a robust paycheck and helps build their savings accounts. Below, we analyze Bureau of Labor Statistics (BLS) data to find the most in-demand jobs for bachelor’s degree holders. To rank the most in-demand jobs for bachelor’s degree holders, we looked at four factors. We examined job growth from 2016 to 2017, average income growth from 2016 to 2017, projected employment change from 2016 to 2026 and projected percent change in employment growth from 2016 to 2026. Check out our data and methodology below to see where we got our data and how we put it together to create our final rankings. STEM, as ever, is a good bet STEM jobs tend to be high-paying and, according to our data, will be very popular in the future. 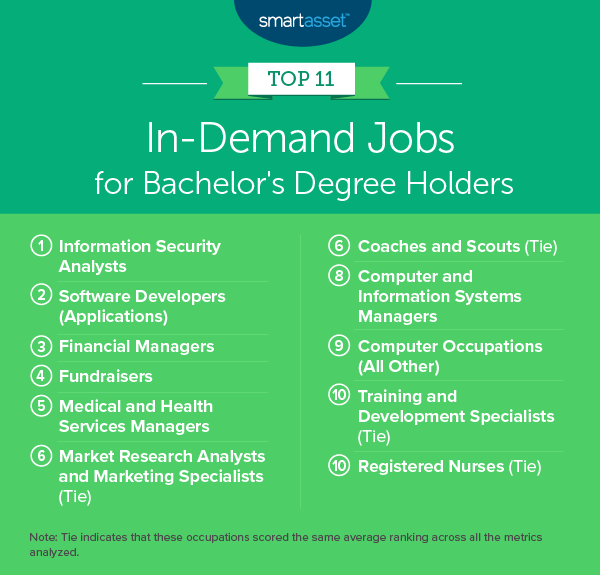 Four of the top 10 most in-demand jobs for bachelor’s degree holders are STEM jobs. Though not all STEM occupations are sure bets: chemists, computer programmers and computer hardware engineers all rank in the bottom 10. To be fair to those bottom-ranking occupations, though, they would not be bad jobs to have despite not being as in-demand as others. They each have an average income greater than $80,000. Positions at the top are disappearing If given the opportunity to be CEO, you should probably take on that responsibility in exchange for the robust compensation: After all, the average CEO earned nearly $200,000 in 2017. From 2016 to 2017, the number of CEOs fell by nearly 6%, and BLS data suggests the number of CEOs will fall between 2016 and 2026. Chief executives ranked last in our study. Creative professions are not in demand If you want to become an editor, writer, author, composer or graphic designer, you should probably do it for love rather than money or job security. Each of these creative jobs ranks in the bottom 35 in-demand jobs. You perhaps don’t need data to confirm how important information security analysts are to the future economy. Massive data breaches create headlines and headaches across the country on a regular basis. But according to the data, information security analyst is the most in-demand profession for bachelor’s degree holders. From just 2016 to 2017, the number of people working in this occupation grew by 8.7%, the sixth most in the study. Average incomes for professional information security analysts increased by 4% over that same interval. From 2016 to 2026, the BLS projects the number of information security analysts to increase by 28.4%. Just looking at the raw numbers, software developer may be the safest best for a long-lasting career. The BLS expects there to be 253,000 more application software developers in 2026 than in 2016. That represents an increase of more than 30%. From just 2016 to 2017, their numbers grew by 7%. One thing keeping software developers in second is the unimpressive income growth figures. From 2016 to 2017, average pay for a software developer grew by only 2.3%. Managing the finances of an organization is a high-paying occupation with a bright future. The average person working in this job earned more than $143,000 per year in 2017. That’s an increase of nearly 5% on the 2016 figure. The main reason an educated individual would want to zero in on this career, though, is its long-term prospects. The BLS expects financial manager jobs to grow by 108,400, or just under 19% from 2016 to 2026. If you’re a bachelor’s degree holder with a passion for raising funds, you’re in luck. That job has a long and prosperous future. From 2016 to 2026, the BLS expects the number of people working as fundraisers to grow by nearly 15%. Other than explosive job growth, incomes for fundraisers are also rising. BLS data shows that the average fundraiser saw his or her income rise by just under 6%, from 2016 to 2017. One fact of the American economy that is unlikely to change soon or in the next decade is the overwhelming cost of health care. With an aging population, the overall demand for health care will also rise. That’s good news for health care professionals across the country. This is why last year we found that personal care aides were the most in-demand jobs for people of all educational backgrounds. Managing medical and health services is a lucrative career for bachelor’s degree holders in the health care space. The average person in this occupation earns slightly less than $112,000 per year, up 4.5% from the year before. Long-term prospects look good as well. The BLS projects growth of just under 20% for this occupation. Tied in sixth is the following occupation: market research analysts and marketing specialists. This occupation saw robust growth from 2016 to 2017. The total number of people working in this profession grew by nearly 7% over that period. Incomes, unfortunately, did not quite have the same uptick, growing by only 1.2%. The next decade should be a good one for this occupation, the BLS reckons. In both total job growth and percent job growth from 2016 to 2026, this occupation ranks in the top 5. For those with dreams of an athletic career, your best bet may be to switch from being an athlete to coaching or prospecting. From just 2016 to 2017, average pay in this occupation grew by 3.8%. From 2016 to 2026, the BLS estimates the number of coaches and scouts will grow by just under 13%. Another STEM profession takes eighth. This is a high-paying occupation in which professionals earn nearly $150,000 per year. Over the next decade or so, the BLS projects job growth of 43,800, or 11.9%. In each of those metrics, this occupation ranks in the top 20. If you’re getting a college education and want to secure your future chances of getting a job, STEM degrees in general and computer science, in particular, are a good bet. General computer occupations grew 21% from 2016 to 2017, with income growth of 2.5%. This occupation ranks first and 38th in those two metrics, respectively. Helping train and develop the workforce of tomorrow is an in-demand job. This occupation does not stand out in any one metric but scores consistently well on each of the four factors we tracked. In total, this occupation scores 50th for income growth and cracks the top 30 in the other three metrics. Health care and STEM are two of the best bets for well-paying employment in the future. Being an RN is a great occupation for those who want to help take care of people. The average registered nurse earned slightly less than $74,000 per year in 2017, a modest increase of 1.9% from 2016. But while the pay growth may not grab eyeballs, the future growth should. The BLS expects an additional 437,000 registered nurses to join the workforce between 2016 and 2026, the biggest increase in the study. The percent change in average incomes from 2016 to 2017. This is the percent change in mean earnings for an occupation from 2016 to 2017. Data comes from the Bureau of Labor Statistics’ Occupational Employment Statistics for 2016 and 2017. The percent change in employment from 2016 to 2017. This is the percent change in the total number of people employed in an occupation from 2016 to 2017. Data comes from the Bureau of Labor Statistics Occupational Employment Statistics for 2016 and 2017. The projected total employment change from 2016 to 2026. This is the projected change in the total number of people employed in an occupation from 2016 to 2026. Data comes from the Bureau of Labor Statistics Employment Projections. The projected percent change in employment from 2016 to 2026. This is the projected percent change in the number of people employed in an occupation from 2016 to 2026. Data comes from the Bureau of Labor Statistics Employment Projections. First, we ranked each occupation in each metric. We then found each occupation’s average ranking. Using this average ranking, we created our final score. The occupation with the best average ranking received a 100. The occupation with the worst average score received a 0. 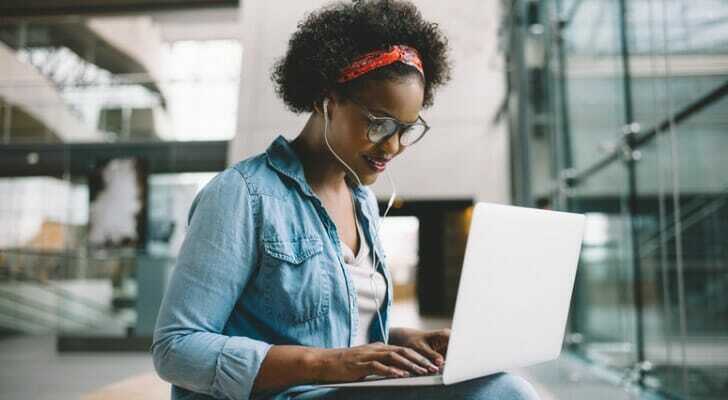 Open a high-yield savings account If you’re looking to grow the savings you build up at your in-demand job, online-only banks like Ally and Synchrony offer annual percentage yields (APYs) far above those of traditional retail banks. Another good option if you know you won’t need a certain chunk of your savings is to lock it away in a certificate of deposit (CD). Those often offer even higher returns with almost no risk. Use an expert A high-yield savings account or a CD can only take you so far. If you want true financial independence, you may want to talk to a financial advisor. If you are not sure where to find a financial advisor, check out SmartAsset’s financial advisor matching tool. It will match you with up to three local financial advisors who fit your particular needs. The post The Most In-Demand Jobs for Bachelor’s Degree Holders 2019 appeared first on SmartAsset Blog.